The city’s very first African American settlement was located at Lake and Kinzie. The community, made up of free women and men as well as runaway slaves, soon gave way to the growing number of European immigrants who arrived in Chicago in the 1840s, 50s and 60s. Here, the Irish settled in wooden shanties and barns — the infamous Mrs. O’Leary (she was innocent!) had her home near Jefferson and Taylor. Later, German, Czech, Greek and Italian populations were ever present with the latter two eventually creating somewhat permanent settlements that we now know as Greektown and Little Italy. Russian and Polish Jews also called the area home and it all lovingly came together at one of Chicago’s most historic gathering spaces: Maxwell Street. Jane Addams would provide food and shelter for many of these new residents; Hull House would become a model and pioneer in the national settlement house movement. And by the mid 20th Century, the University of Illinois at Chicago would create a completely different kind of community. West Randolph and Fulton Market streets were also home to the bustling wholesale meat and produce industry during the 19th and 20th Centuries. Famous names like Armour and Swift were one of many companies who had their vast networks of food processing and distribution rooted in the area. This is Chicago’s oldest food district in the city and it’s come full circle. History does, indeed, repeat itself. Tucked away on a surprisingly quiet little block in the West Loop, you’ll find a shining star in Chicago’s craft brew culture. Established in 2014 by friends Brian Buckman, Jason Monk and Matt Shirley, Illuminated Brew Works is community at its finest. They moved into their current communal space, a historic Nabisco factory building that also houses a coffee roaster, a knife maker and a woodworker, during the summer of 2013. Like many projects, the trio had a different kind of big picture vision for what their brewery was originally going to be. Eventually they decided that they would strip down their concept to its barest components and completely finance the brewery on their own. Their approach to creating their brewhouse has thus been slow and organic. And Brian’s approach to making beer is one that is always evolving. Farmhouse style beers are a favorite because it’s a style that can often be left open to interpretation. Look for Orange Sunshine, a staple during the Spring and Summer months. Or maybe we’ll all be lucky enough to see the return of Ed’s Legs, a farmhouse beer rooted in the fabled history of a West Loop resident turned saloon owner because of his supportive community. You’ll also want to head to Publican soon to get your hands on, Rosetta Stoned, a brown Brett farmhouse ale that was made as one of their collaborations with Publican Beer Director, Adam Vavrick. And although IBW refers to themselves as urban farmhouse producers, don’t think you won’t find creative approaches to other styles. Hasselhopf, a hop forward pale ale is almost as impressive as a talking car. 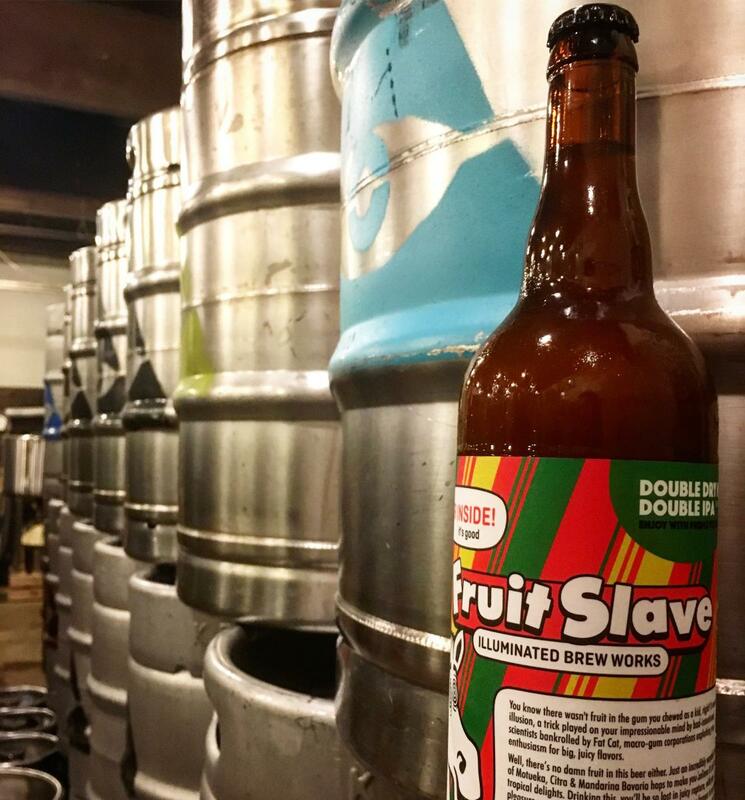 Hot off the presses this week is Fruit Slave, a juicy double dry hopped double IPA that has some label fun with a zebra endorsed brand of gum. This Fall and Winter, keep your eye out for Pazuzu’s Petals, a cute and devilishly delicious porter. While styles and creative approaches to beer will vary, one thing you can count on is size, because it matters. Illuminated beers come only in 750ml bottles because the large format allows the brewery to get more experimental with their beverages. Illuminated releases a new beer every two weeks — leaving the masses excited while challenging the brewers and keeping everyone on their toes. Cracking open a larger bottle also encourages sharing, as you would a bottle of wine. There’s that community thing again. And if you’re looking to drink with this particular community, be sure to sign up for the IBW newsletter for your chance to attend one of their many bonfire gatherings in their back lot. Chicago’s skyline, live music, complimentary beer, and a big ol’ bonfire is certainly bound to kindle new friendships. 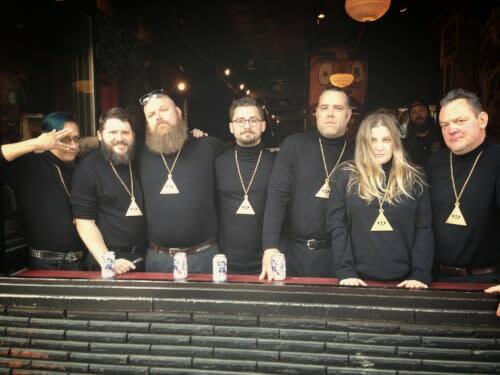 Illuminated Brew Works is a curious collective of creatives who, like any good fraternal organization, come together for a common purpose. In this case, IBW has created a passionate space for beer makers and beer lovers alike, brightening both the West Loop and Chicago’s brew culture one delicious beverage at a time. Check out Illuminated Brew Works when Friday Night Flights takes over the West Loop tonight August 11, 2017. The next installments of this summer-long beer series will be August 18 on the Chicago Riverwalk and August 25 in the Ravenswood Corridor. Need immediate gratification? Learn more about Chicago breweries and tour six neighborhood beer trails at choosechicago.com/craftbeer.